An introduction and set-up for the Heltec Automation WiFi Kit 32 development board with OLED display. Follow the steps below to have the example WiFiScan script show your local access points on the built-in display. This board is based on the ESP32 chip and has onboard WiFi, Bluetooth, a 0.96 OLED display, lithium battery connector charging and a CP2102 USB to serial interface. It also works with the Arduino IDE. They are available from the Heltec Store on Aliexpress. Inside this folder open the hardware folder and find and delete either the esp32 folder or espressif folder. First unplug any boards you have connected and close the Arduino IDE if it’s open. For these boards to show in the Arduino IDE you have to install the hardware libraries locally using Git. Git is basically a way to keep local files synchronized with files on the internet. In this case it’s used to download the files used by the IDE to work with the ESP32 boards that are available. In the Target Location box enter: C:/Users/[YOUR_USER_NAME]/Documents/Arduino/hardware/espressif/esp32 replacing [YOUR_USER_NAME] with your login name. You can see this name on the Start menu by mousing over the grey circle icon. Click Clone to start cloning the files to your PC. This might take a while. When this has completed navigate to this directory: C:/Users/[YOUR_USER_NAME]/Documents/Arduino/hardware/espressif/esp32/tools and double-click get.exe. Again this might take a while. Start Arduino IDE, select your board in Tools > Board menu and select the COM port. To test the board is basically working you can use the example WifiScan sketch here: File> Examples > Wifi > WifiScan If you open the Serial Monitor (Tools > Serial Monitor) you will be able to see any WiFi access points in range. Check the baud rate is the same as in the sketch – probably 115200. 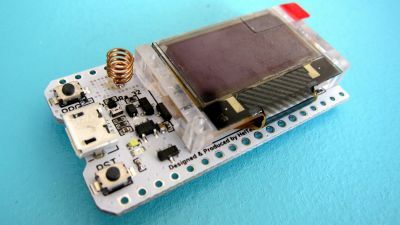 Once you have the ESP32 libraries installed and you’ve tested that the board can run the basic WifiScan sketch we can install the display libraries for the OLED. My favourite display library for these OLEDs is the U8g2 (https://github.com/olikraus/u8g2) library. This is a lot easier to install as it can be found in the Arduino IDE library manager. Open Sketch > Include Library > Manage Libraries and search for and then install U8g2. U8g2 has three different display methods. If you want to quickly test all three, the following examples show the correct constructor. So, what are the numbers clock=*/ 15, /* data=*/ 4, /* reset=*/ 16 for in each of the examples above? These are pin numbers for the I2C controlled OLED on the board. This tells the display library which pins to use to communicate with the display. Sketch uses 439175 bytes (42%) of program storage space. Maximum is 1044464 bytes. Global variables use 36312 bytes (12%) of dynamic memory, leaving 258600 bytes for local variables. Maximum is 294912 bytes. What did happend and how to restore my board? Is it still broken? I’m not sure how to fix it but I saw this.. But this is using python to work with the board so it’s a little outside my area of knowledge. I have the Heltec WiFi_Kit_32 version of this amazing module. I cannot get a text display when using the Adafruit_SSD1306 library. It works with the U8x8 librray, but I have a lot of previous code from other platforms using Adafruit_SSD1306.h that I would still like to re-use on the ESP32 platform. I have tried Wire.begin(4,15) and OLED_RESET 16 and setting 16 LOW then HIGH. I am not not getting any display on the OLED. It compiles fine, but no display on OLED. I did initially use the acrobotic SSD1306 library but have since moved to the one by Squix https://github.com/squix78/esp8266-oled-ssd1306 because of the font generator. Haven’t tried the u8g2 library yet. Thank you for the time making this page. It is showing up as the top google result. I have 2 questions perhaps you can help me answer. 1) Does the OLED have its own I2C bus? I want to use this amazing board to control some I2C devices but am not sure it the I2C bus is already occupied but the OLED. I read somewhere that some LED libraries are using a software written I2C driver, not the hardware I2C. 2) I had some code for the ESP8266 that someone wrote that would put the chip into AP mode and had a web server. You would connect to its Wifi network to configure the chip to connect to your wifi network through the web pages. Once configured, the chip rebooted in client mode and would join the network you configured as a client. Is there similar code out there for this board? Does this program / function have a name? Looks like there are hardware iC2 pins. For your second question… I don’t really understand what you want to do. It looks like there is only the one I2C pins. which are used by the onboard display, GPIO 4 and 5. Was hoping the pins labeled on the board “SCL” (GPIO14), and “SDA” (GPIO2) would be that hardware I2C but it does not appear to be. I wonder what pins ” Wire.begin();” uses. This page http://stefanfrings.de/esp8266/#wifikit8 (use the translate feature in Chrome) shows the pins for the two different board versions. Doesn’t look like there’s another I2C bus. Can you not connect more than one device to this bus as well as the display? WordBot thank you for the article! Do you know how to connect RFID MFRC522 to the board. I tried to connect a RFID to existing MISO,MOSI, SDA, SCK and I the board does not see the RFID. I don’t know. The pins should be as in the diagram here – https://github.com/Heltec-Aaron-Lee/WiFi_Kit_series/blob/master/PinoutDiagram/WIFI%20Kit%2032.pdf and your code should reflect those pins. I want to do some RFID things but I haven’t bought any hardware to test with yet. Thank you for your response! Actually I made one step further. I got response from the RFID reader, but only a firmware version. If you have any idea what would be wrong it’d be awesome. Nice clear web site and got me , a newbie, going. I had problems initially uploading to the ESP32 but found that I needed to press PRG and hold it, then press the RST momentarily, then release the PRG button. The screen would go blank and it would wait until the upload began. This worked at the full speed. I managed to upload several sketches ok. However, I’ve since disconnected the ESP32 and reconnected and now I’ve got a driver problem. I did the manual update to the version 10 driver from the site you mention above but that didn’t solve it. It seemed to then mess up my Arduino driver but i have been able to recover that. Can you see anything with question marks in Device Manager? Yes the ESP32 USB bridge had it. The error was No 10 – Failure to start or something. After lots of messing with different versions of the drivers I took all the other things out of the USB ports (a GPS, hard drive, bluetooth dongle, the Arduino and the ESP32). Then with just the ESP32 board back in it started ok. I put the rest back in one by one and they all seem ok now. I’m using the v10 driver. The only problem now is that the full speed upload fails so I’ve reverted to 115200. Not a problem as it’s the compiling that takes most of the time, not the upload. Why does it take so long? A real pain if you are trying to debug a program. Did you check it was on the correct port? https://robotzero.one/wp-content/uploads/2017/12/select-port.jpg . It does sound like a driver problem if you saw a question mark. Maybe Windows had assigned a different port when you plugged it in the second time? I think compiling takes time as the ESP32 is much more complex than a basic Arduino so there’s a lot more work to do when compiling. In general compiling code is a slow process. Is this the Lora board? This is the library – https://github.com/espressif/arduino-esp32/tree/master/libraries/WiFi but I think this is installed when the board is installed. Maybe there’s a conflict on your device with another library? Read the Compiler messages exactly: Ther are more “Wifi.h”. how to add support built-in OLED Heltec WiFi Kit 32 to https://github.com/Edzelf/ESP32-Radio ? Is there a way to take control of the one on-board LED that just blinks continuously? Hi Bruce, no………that LED is part of the battery charging circuit and will only go off when a fully charged battery is connected. Whilst a battery is charging, the LED will go to a steady on state until the battery is fully charged then it will go off.